I purchased my Abu Garcia Revo MGX 30 after I accidentally drove over my rod and previous reel (the Daiwa EM MS 25000H) – what an idiot! The rod was fine, but the reel was a mangled mess! I have therefore been using my MGX exclusively since late March 18. The criteria was to find something very light (sub 200g) with a spool capacity that would allow me to add some backing (I use cheap 6lb monofilament) and then 150 yards 20lb (0.15mm) braid, so that I could achieve two completed spools with a 300 yard spool if you see what I mean. I also wanted something with a more substantial gear or retrieve ratio than my previous reel of at least 6.0:1, so that I had the ability to ‘bully’ a bass away and out of the snags in the shallow water I regularly fish, if and when required. Furthermore, the prerequisites of perfect line lay (that you’d expect on any reel nowadays) alongside a modicum of durability had to be fulfilled within a budget of around £150 – the reason being that I don’t mind spending this amount on a reel that will last me the entire season (April-December as a minimum). 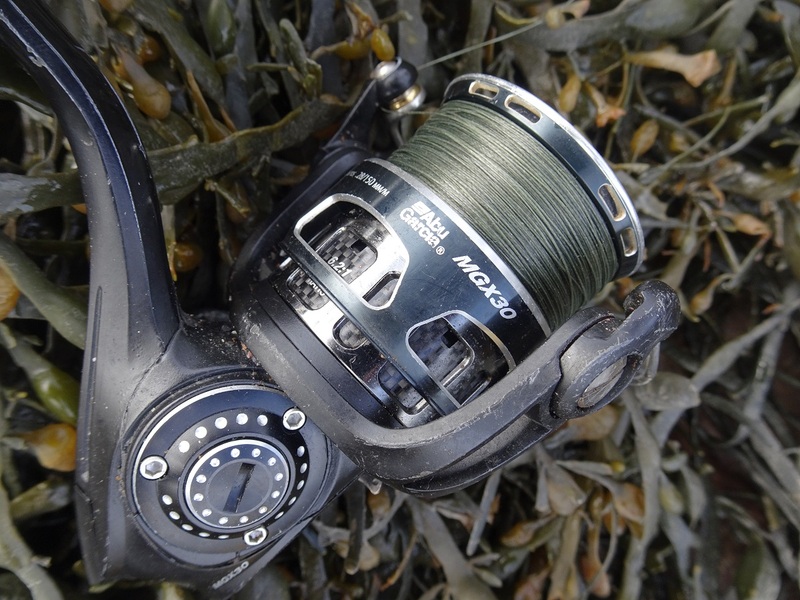 I considered two other reels at the time which were the Shimano Stradic CI4+ 3000 HG FB here and the Penn Conflict II 2000 here which I know from my clients appear to be very good reels. There are a number of variants within the ‘Revo’ family that, as you expect, decrease in price and overall features but gradually increase in weight as you drop down through the range. These include the Premier, Inshore Spin (that has additional saltwater corrosion resistant body on the 40-60 sizes which are a bit too substantial for me), the STX, SX, X, S and Rocket. The MGX had sat at the top of the Revo tree since its release in 2015, but recently it has been trumped by the MGXtreme (see Abu’s 2019 catalogue here). The 30 size in this guise weighs in at an astonishing 167g – over to you Daiwa and Shimano! Price (around £160 but read to the end of this review). “Fish with near effortless precision when you attach an Abu Garcia® Revo® MGX® Spinning Reel to a premium rod. This reel’s featherweight construction rests on Abu Garcia’s 1-piece gearbox made with X-Mag magnesium alloy, anchored by a C6 carbon body, stem, and rotor topped by a machined-aluminium braid-ready spool. 11 stainless steel HPCR bearings + 1 roller bearing provides increased corrosion protection. AMGearing system provides precision machined gears for unparalleled smoothness and durability. Computer optimized (COG) gear design allows for the most efficient gear system. One piece X-Mag alloy one piece gear box provides a super light yet extremely strong gear housing. C6 carbon body provides significant weight reduction without sacrificing strength and durability. C6 carbon rotor provides significant weight reduction without sacrificing strength or durability. Rocket Line Management System provides better control of all types of fishing lines. Flat EVA knob provide greater comfort and durability. Machined aluminium braid ready spool allows braid to be tied directly to the spool without any slip. Aircraft grade aluminium main shaft. I eventually decided to take a punt on the Abu Garcia Revo for a number of reasons. Firstly, I like a reel with a very slow spool oscillation, as it I prefer the line lay that it provides and for some reason a reel with this attribute always seems to be associated the more luxurious (expensive) models. Secondly and more significantly, it was the claim that the ‘AM’ (Aluminium Machine) cut gears and computer optimised (is this apparent in most reels?) gear design are housed and held precisely in place within the one piece ‘X-Mag’ alloy gearbox. Not that it really matters but my final reason was, I have to admit, because I also considering the Revo to be more aesthetically pleasing. Above all though, it was the claim that the gears couldn’t move or flex that convinced me to go for it above the others. Now the reason this is important to me is that I (like all of us) occasionally drop or knock my reel against rocks, and I am positive that part of the reason why some of my previous reels have lost that buttery smoothness (alongside components rusting following contact with saltwater or the amount of grease being reduced) is because the gears are effectively knocked out of alignment (only very slightly) meaning the meshing isn’t quite as precise as it is when a reel is taken out of the box and first used. Notwithstanding the aluminium main shaft and corrosion resistant bearings there isn’t anything to claim that the reel is especially saltwater proof or resistant, but as I mentioned, providing it lasted me a season I would be content. As soon as I opened the box I was impressed – who wouldn’t be? It is a beautiful looking spinning reel that you almost want to place on the mantlepiece rather than get it splashed in saltwater, knocked about and splattered with mud and sand! Like my previous high-end Mitchell spinning reels, as you screw the reel handle into its housing and you turn that mechanism, firing the reel into life, it just makes you purr – it is class. I remember thinking ‘Wow! If this reel performs as well as it looks I will be a happy man! The spool is ‘braid ready’ however, I would recommend adding some ‘backing’ unless you’re content to load a significantly high percentage of a 300 yard 20lb spool onto it as I’m not entirely convinced by the stated capacities, although much depends on the diameter (not necessarily the breaking strain) of the braid you’re using. So it looked better in the flesh than I thought it would, it felt lighter (193g for the 30 model) than I expected and yes, it felt silkier than any reel I had previously used before. This is all great of course, but what would it be like out on the coastline? An early season session in which my new reel was put through its paces – although it doesn’t look quite as pretty after 10 months of use (see below). I fished on for a further hour or so and on returning to the car I remembered the bottle of water I had stashed in the boot to wash down my reels in case of such an event! I duly ‘washed’ the reel and upon returning home I made a point of washing it again and allowing it to dry naturally – hoping that I hadn’t ‘wrecked’ the internal components first time out! During subsequent sessions in early April and May one of the things that struck me was the amount of line that it would recover (gulp down almost) on the retrieve. 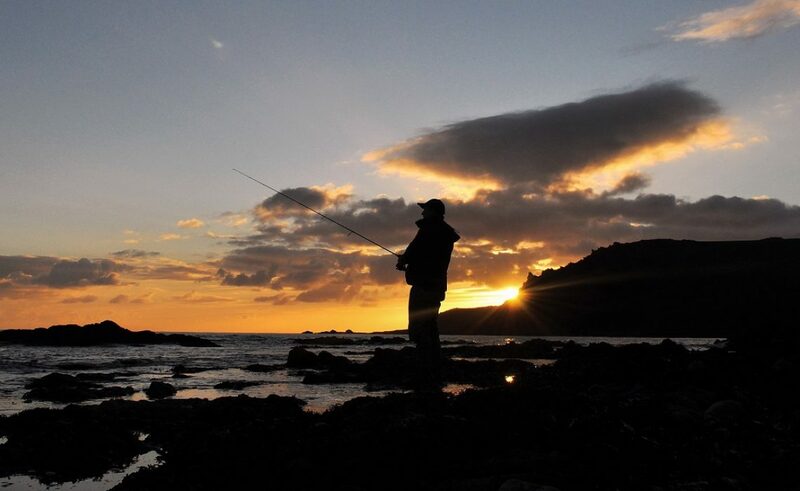 But the beauty of owning a reel that possesses that wonderfully slow oscillation and velvety gearing, is that when you are retrieving a weightless soft plastic very slowly, you actually get to appreciate its overall quality and just how ‘nice’ the reel really is – it was a complete pleasure to use. The Revo MGX 30 boasts a pretty substantial gear ratio that retrieves 89cm of line per full turn of the handle. As you can see, there are a few ‘battle wounds’ present after almost 11 months of use. As the season progressed, whether if I was working a diving minnow or a needlefish (all of which generally require a quicker and steadier retrieve) I remained very impressed with the reels ‘smoothness’ and performance whilst taking care to adjust my rate of retrieve appropriately (taking into account the increased gear ratio) to ensure my lures were travelling at the desired speed. Of significance, when utilising a small, medium or large surface popper or sliding surface lure (which occurred increasingly into the summer and autumn) I tend to work the lure and turn the handle in a stop, start, stop, start motion especially in relation to the surface poppers. With many (if not most) of my previous reels, when fishing in this way, I have often found a point where the handle/gears ‘stick’ either at the same position each time I rotate the handle or just each time I stop and then attempt to start again – this didn’t occur (and still hasn’t) with what I was becoming to realise was a fantastic spinning reel. Note the ‘Rocket Spool Lip Design’ (the holes around the outer edge of the spool). I can’t say that I’ve noticed any increased distance to my casts over my previous reels, however, the overall control is excellent as you’d expect. Note also the excellent line lay which, to be honest, is the absolute minimum to expect from any modern spinning ‘platform’ as companies like to call them now. I realise that most fishing tackle companies will emphasise the fact that their spinning reels boast a smooth (that word again) drag system and Abu Garcia are no different. However, I have been very impressed by the level of consistency that the drag on this reel provides, although I’m not saying its ‘better’ than this reel or that one – let me explain. The way I ‘fight’ (sounds awful) my bass, I do allow them to take some line. The way I describe it to my clients is that (generically speaking) if a bass around 3lb hits the lure hard and runs I enable it (initially) to take 1-2m of line, if a 4lb bass hits it then 2-3m, and a 5lb bass 3-4m and so on. Of course, this is all very dependent on where you hook the fish (if rocks are protruding above the surface I will tighten the drag for instance) but if clean(ish) ground is in front of me and a bigger fish decides to take off, particularly in darkness, then I will let it. The Revo has been brilliant at managing this I have to say, and any final lunges by larger bass have been a delight to control. A good-sized bass that hit a needlefish in very shallow water only yards from my feet – it is moments like this when a reliable and appropriately set drag is essential otherwise you risk puling the hooks out. As July arrived and the summer heat increased I found that my Revo required a little bit of TLC by way of a drop of oil in the roller bearing and some grease on the main shaft – that is about the limit of my servicing expertise! Something to note however, is that I am terrible at looking my reels. If they get dunked or splashed, then as mentioned earlier, I will, of course, wash them and dry them. Yet outside of these occurrences I don’t touch them (terrible I know but I’m just being honest) as I know what I’m like – I’ll get to the shoreline and then remember I’ve left my reel on the draining board! In good old debriefing fashion, I will place the negatives or ‘areas to improve on’ in the middle of this report! So are there any negatives – in a nutshell ‘No’ not that I can find following some brutal use and borderline neglect! Areas for improvement then, and some may find it rather irritating that the reel doesn’t just come with a standard spare spool rather than the shallow ‘finesse’ spool provided. Personally, this isn’t a problem as I am struggling to think of an occasion when my ‘spare’ has been brought into action. Again, this is just a personal preference, but I think a reel with this kind of ‘cranking power’ requires, (deserves almost) something more substantial than what I consider to be a handle grip to be more suited to reels in the 1000/2000 size. The ‘sharp-eyed’ amongst you may well have noticed that the handle on my Revo is different in the photographs of the bass I have captured since around October – it is in fact taken from the Revo MGX 3000SH (another variant) that I had imported from Australia. I’m not just ‘plugging’ my book here I promise! Note the ‘meaty’ replacement handle courtesy of the 3000SH model that I think is more appropiate for reel with such a high gear ratio. It has enhanced my overall enjoyment of using it. In summary, there is nothing negative whatsover to report, which leads me nicely onto what I like and why I rate this reel so highly. The evening before last, when I was retrieving a 12g weedless/weightless senko at a snail’s pace, up to a two full turns of the handle per second, the MGX still felt absolutely sublime in every way – solid, yes still ‘smooth’ and performing as if it is going to last well into the spring and hopefully beyond. Indeed, I have a brand-new one that is still sat in its box in my office for me to admire! The drag has been put to the test on a regular basis during January (see my recent catches here plus I have some more recent catches to report on in my next post), the very slim bail arm that I also really like (which is far slimmer than it appears in the close up images above) is operating perfectly and most importantly it has retained that ‘straight out of the box’ almost gliding, buttery motion as you turn the handle. Furthermore, due to my writing and guiding commitments, there were long periods when my set up was just ‘dumped’ in the car or garage with all manner saltwater substances left rotting away on it before, when a brief window of opportunity presented itself, I was able to head out – on each occasion it performed admirably. For me, this proves just how well the Revo MGX is put together as it is sporadic use and poor storage such as this that often signals the ‘death knell’ for a spinning reel. A cracking October bass that I hooked only inches off of the rod tip before it ripped line against the drag. Note the ‘different’ handle assembly that makes this reel even more of a joy to use. Clearly, there are a lot of positives, but for me, the most impressive attribute has been and still is the reel’s overall durability despite my unintentional efforts to largely treat it with disdain – I promise that I will treat the one still in its box in a more attentive manner. Without a shadow of a doubt, it is by far and away the finest spinning reel that I have owned – pure and simple. Bizarrely, none of the big online stores are stocking these reels, and quite frankly, it is an absolute minefield when it comes to finding one at a price that represents extremely good value for money as I have seen them advertised at prices upwards of £240 (which I probably would still pay incidentally). But thank goodness for eBay! I paid £147 for mine (during a sale) from a company called Basstastic Supplies here back in March. But I’ve looked and they aren’t currently selling them which is shame. However, there is another UK company called The Angling Centre that are selling them with free postage at £164 here so if you’re tempted this is your best bet. I welcome any feedback or information regarding anyone’s experiences with this marvellous spinning reel. Previous 3 Day Packages – 2019 Dates Released! Excellent review, and nice to see a reel reviewed that isn’t reviewed a lot. I am a Shimano man but will have a look at this reel!